The Apartments Eccher Renzo are situated in Castello di Fiemme, in a quiet location away from the traffic, but only 5 minutes walk from the centre of the village. The house offers a beautiful view on the wonderful landscape of the Dolomites. The apartments are equipped with 8 beds in 4 rooms: 2 double bedrooms, 1 twin bedroom and a room with bunk beds. There are also 2 bathrooms with shower and a very large living room with kitchen. At guests' disposal there is a free car parking in the garage and an outdoor parking. The apartments are the ideal choice for families. Your children will certainly enjoy the nearby playground. Stay 3 nights ,in comfort apartments with view on the Dolomites with 7/9 beds, 2 bathrooms, a very large kitchen, garage and parking space. A special offer for a week in apartments with view on the Dolomites. The apartments, suitable for up to 7/ people, are equipped with every comfort and consist of 3/4 rooms and 2 bathrooms, very large kitchen, garage and outdoor parking places. 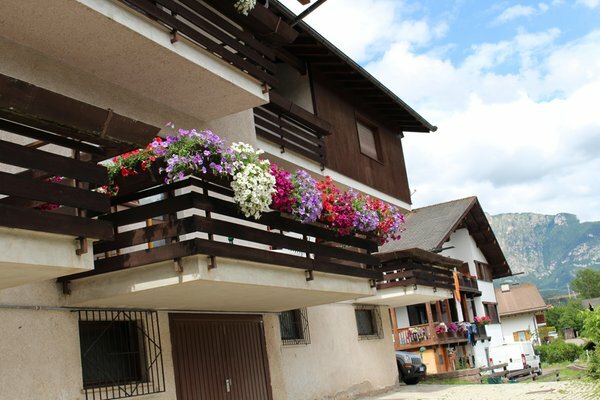 On two floors; on the ground floor: kitchen, living room, bathroom with shower; first floor: four bedrooms and one bathroom; sat-TV, dish washer, washing machine, two terraces with wonderful view of the Dolomites; two car parks. 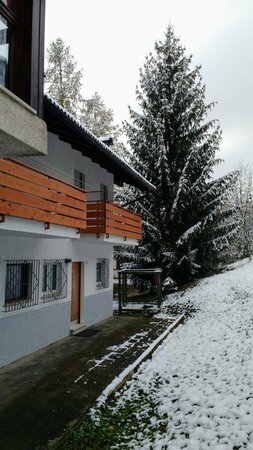 On two floors; on the ground floor: kitchen, living room, bathroom with shower; first floor: three bedrooms and one bathroom; sat-TV, dish washer, washing machine, three terraces with wonderful view of the Dolomites; two car parks. Information about the location: at 1000m amsl, 400m from the bus stop, nearest slopes at 3km, closest cross-country trails at 4km. Are you interested in Apartments Comfort Casa Eccher?